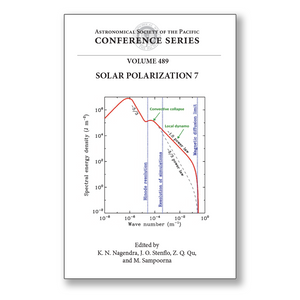 Editor(s): Nagendra, K. N.; Stenflo, J. O.; Qu, Z. Q.; Sampoorna, M.
This volume contains the proceedings of the 7th in a series of international solar polarization workshops that was initiated almost two decades ago. The aim of these workshops has been to explore the Sun and its magnetic field with the tools of spectro-polarimetry. The theoretical topics discussed herein deal with the physics of the interaction between radiation and matter in magnetized media, including its application to the exploration of the properties of magnetic fields. Observational topics include the design and operation of high-precision imaging Stokes polarimeters for use with both spectrographs and tunable filter systems. Scientists from many countries converged in Kunming, China during September 2013 to discuss the significant advances that have been made since the previous workshop, which took place three years earlier on Maui, Hawaii. Examples of topics that were addressed during the seventh workshop include: properties of magnetic fields in the quiet and active Sun, particularly at scales far smaller than the resolution limit of telescopes; scattering polarization and its use to diagnose magnetic fields in regimes not accessible using the Zeeman effect; polarized radiative transfer with partial frequency redistribution, quantum interference, hyperfine structure, optical pumping, and numerical techniques to solve 3-D radiative transfer problems; and various innovative instrumentation projects in ground-based and space-based polarimetry. This proceedings volume captures the discussions during the workshop and provides an updated overview of the state of the art in this rapidly evolving front-line area of solar and stellar astrophysics.